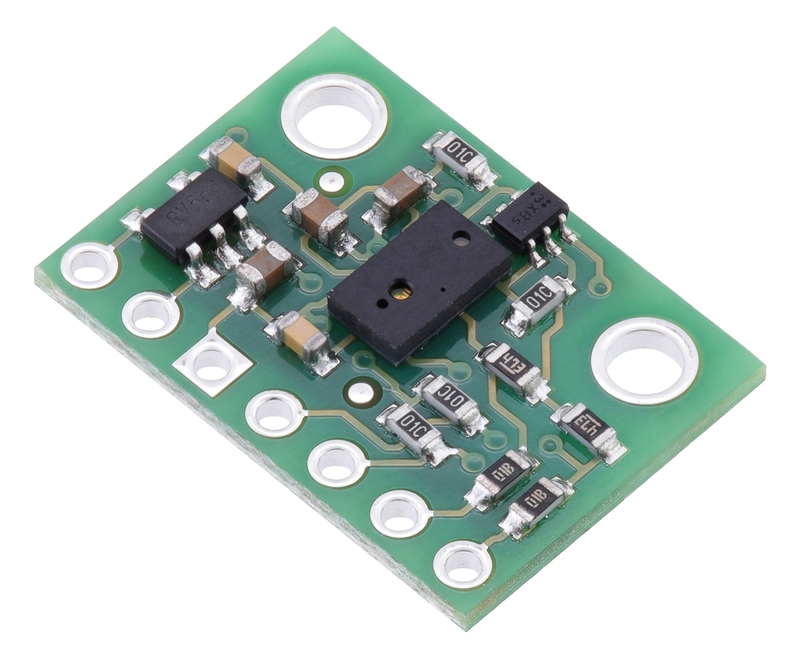 This sensor is a carrier/breakout board for ST’s VL6180X proximity and ambient light sensor, which measures distance with 1 mm resolution over a detection range of 0 cm to 10 cm or greater. The VL6180X uses time-of-flight measurements of infrared pulses to determine the range to a target object, allowing it to give accurate results independent of the target’s color and surface. Distance and ambient light level measurements can be read through a digital I²C interface. The board has a 2.8 V linear regulator and integrated level-shifters that allow it to work over an input voltage range of 2.7 V to 5.5 V, and the 0.1″ pin spacing makes it easy to use with standard solderless breadboards and 0.1″ perfboards. 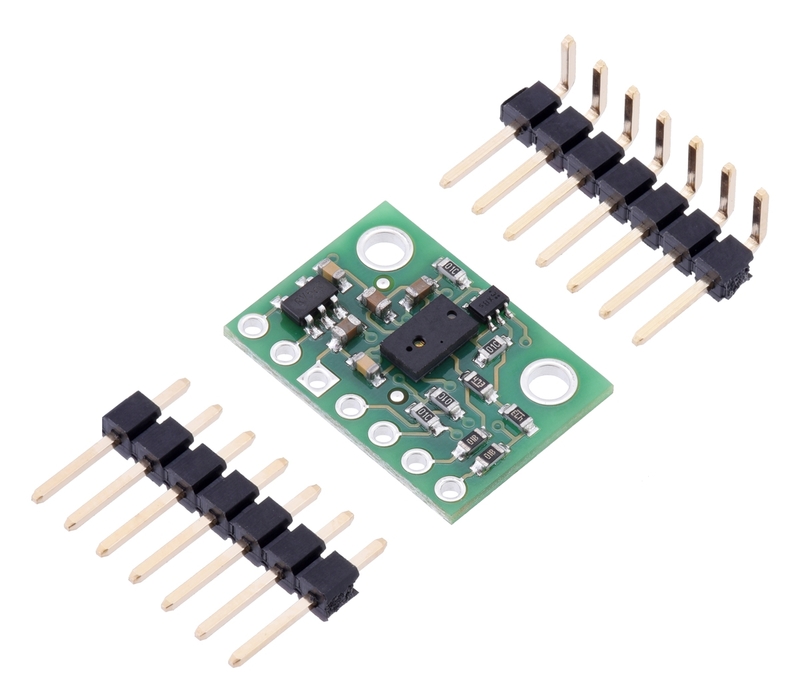 The VL6180X from ST Microelectronics is a sensor that combines proximity ranging and ambient light level measurement capabilities into a single package. This board is a carrier for the VL6180X, so we recommend careful reading of the VL6180X datasheet (1MB pdf) before using this product. Unlike simpler optical sensors that use the intensity of reflected light to detect objects, the VL6180 uses ST’s FlightSense technology to precisely measure how long it takes for emitted pulses of infrared laser light to reach the nearest object and be reflected back to a detector, making it essentially a short-range lidar sensor. This time-of-flight (TOF) measurement enables it to accurately determine the absolute distance to a target 0 cm to 10 cm (0″ to 4″) away with 1 mm resolution, without being influenced by the object’s reflectance. (In some conditions, the sensor can measure and report distance to an object up to about 20 cm (8″) away, depending on the target and environment.) The VL6180 also includes an ambient light sensor, or ALS, that can measure the intensity of light with which it is illuminated. 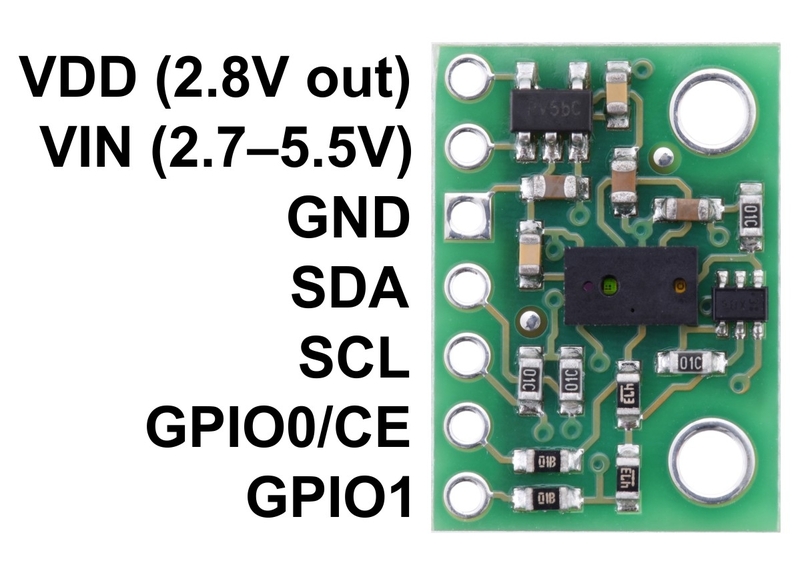 Ranging and ambient light measurements are available through the sensor’s I²C (TWI) interface, which is also used to configure sensor settings, and two independently-programmable GPIO pins can be configured as interrupt outputs. Ranging beyond 100 mm is possible with certain target reflectances and ambient conditions but not guaranteed; the range is reported as an 8-bit value in mm, so it cannot exceed 255 mm. VL6180X Time-of-Flight Distance Sensor Carrier with included header pins. VL6180X Time-of-Flight Distance Sensor Carrier in a breadboard. A minimum of four connections is necessary to use the VL6180X board: VIN, GND, SCL, and SDA. 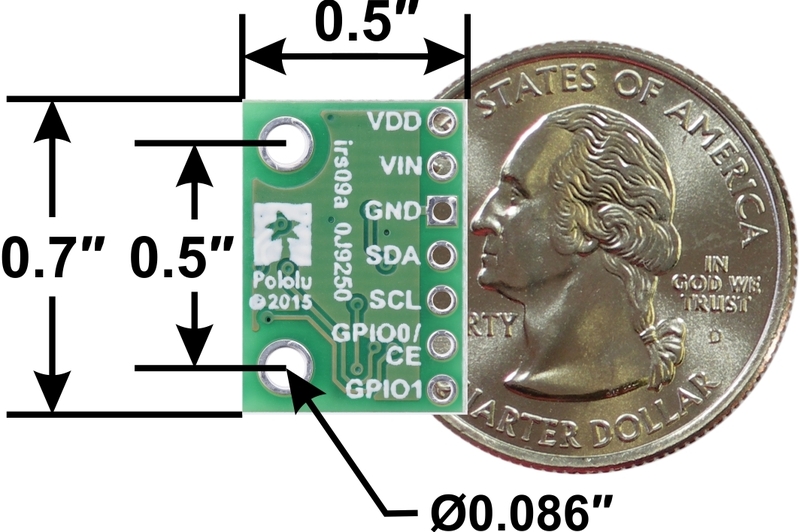 The VIN pin should be connected to a 2.7 V to 5.5 V source, and GND should be connected to 0 volts. An on-board linear voltage regulator converts VIN to a 2.8 V supply for the VL6180X IC. The above schematic shows the additional components the carrier board incorporates to make the VL6180 easier to use, including the voltage regulator that allows the board to be powered from a 2.7 V to 5.5 V supply and the level-shifter circuit that allows for I²C communication at the same logic voltage level as VIN. This schematic is also available as a downloadable PDF (90k pdf). The VL6180X can be configured and its distance and ambient light readings can be queried through the I²C bus. Level shifters on the I²C clock (SCL) and data (SDA) lines enable I²C communication with microcontrollers operating at the same voltage as VIN (2.7 V to 5.5 V). A detailed explanation of the I²C interface on the VL6180X can be found in its datasheet (1MB pdf), and more detailed information about I²C in general can be found in NXP’s I²C-bus specification (371k pdf). Unlike many other I²C sensors from ST, which use 8-bit register addresses, the VL6180X uses 16-bit register addresses. The two documents above can also help you understand basic procedures for configuring the VL6180X and getting readings from it. Additional documents, providing details on many other aspects of the VL6180X, can be found on ST’s product page for the VL6180X. Both distance and ambient light measurements can be performed in either single-shot or continuous mode. In either mode, once each measurement is started, you must poll a status register to wait for it to complete. In continuous mode, you should ensure that the inter-measurement period you select is longer than the time it takes to actually perform each measurement.